When the impending Outdoor Smoking Ban goes into effect in New York City on July 1, 2011; smoking in a public park will no longer be legally allowed. This is one of the most unfortunate things because one of the most relaxed settings for enjoying a cigar is in a park. Well, the good news is that there is at least one park in New York City will remain smoke-friendly – Samuel Paley Park. 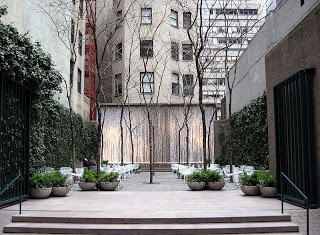 Samuel Paley Park is located on 53rd Street between 5th and Madison Avenue – right in the heart of Midtown Manhattan. Bill Paley, the head of La Palina Cigars was on Cigar Dave this past weekend for his “Cigar Masters” series and mentioned this private park will continue to allow smoking in it. Paley Park was financed by the William S. Paley Foundation and was named after Bill Paley’s grandfather – Samuel Paley. Samuel Paley was the person who created the original La Palina Cigars over a century ago. On Cigar Dave, Bill Paley mentioned that Samuel Paley Park is “open and encouraging” to smoking in a park-like setting. The park is open during the day, but does close evenings. The park currently allows smoking and obviously once the Outdoor Smoking Ban goes into effect, it will continue to be a haven for tobacco enthusiasts. This is great news for cigar enthusiasts as the New York City Outdoor Smoking Ban does not impact private parks. I look forward to visiting this park on my next visit to New York and I will most certainly light up a cigar in this park. I will put a report on this website when I do so.